How we lost all our money, got in the stadium without a ticket, avoided getting arrested, and had a night we’ll never forget. The following was written by David Franco over at Next Level Ballplayer. David is a former teammate of mine and is nice enough to write for Diamond Hoggers from time to time. You can follow him on twitter here. The story starts Thursday night in the middle of watching World Series game 6. Before the craziness starts I feel I need to clarify a few things and introduce the main characters of the following 36 hours we won’t ever forget. Due to our conversations and actions, there are multiple times during this story you might assume we were drunk. Not the case. We had a few beers throughout the night, but the only buzzes we experienced were from baseball euphoria and lack of sleep. Everything that follows is completely truthful… with the exceptions of a few names that will be changed to protect the Cardinal’s front office guy and D1 baseball coach we picked up at 330am… More on that later. Franco: Me. Founder of Next Level Ballplayer. Huge baseball fan that has been to numerous playoff games but never a World Series. Have multiple friends that call me by the nickname, “Dupree” (from the movie, You, Me, and Dupree) for my aptitude of sleeping on couches and making big trips work on little budgets. Currently live in Nashville, just celebrated my one year anniversary with my awesome wife and have a grown up job as a business analyst (NLB paying the bills!). B Witt: One of my best friends since middle school. Two years younger than me. We played baseball with each other in high school and against each other in college. B Witt is the guy that doesn’t quite have the filter that most of the rest of the world has. He tells it how it is at all times, wears his emotions on his sleeve and just kinda does what he feels like… for better or for worse. TStrick: The level headed, responsible, analytical, low key guy, with a master’s degree in Statistics. Our wives are close friends. TStrick is a huge sports fan, but despite being one of my best friends for the past 2 years, hasn’t come around to fully enjoying baseball. With that being said, he claims he’s watched more baseball with me this year than the rest of his life combined… Work in progress! Quick note: None of us are Cardinal or Ranger fans. Just baseball fans… and TStrick. With that being said, we all decide to wear red. B Witt and I are watching the game with a group of friends. B Witt: Franco, if the Cards win this, do we go to St. Louis tomorrow for game 7? Franco: I have to work. B Witt: So do I. Doesn’t matter. It is game freaking 7! Franco: Good point. How long is the drive? Franco: Ok, lets check tickets. At this point in the night, the cheapest tickets on Craigslist are $350. We decide to keep watching the game before making any rash decisions… Fast forward to the 11th inning. After the unreal roller coaster that was the last three innings of one of the most incredible games in World Series history, we decide we have to go to St Louis. We get on Craigslist and now the cheapest tickets to game 7 are $450. Neither of us can afford it. We decide to just stay in Nashville and watch it at a sports bar. 7am- B Witt wakes me up with a phone call. I hear a rerun of Crocodile Hunter in the background (who watches that with breakfast?!) We debate going to game 7 in St Louis. Too expensive. Can’t do it. 7-11:25am- Intense Internal Debate while working. 1125am- My new buddy David sends me his youtube vid of him in Busch Stadium during the last out. I get chills and super pumped up. This starts taking me over the edge. Wife: If been thinking about you at work this morning. I think you should go to St. Louis. When are you going to get another chance to go to game 7 of the World Series? (Great point!) Let the ticket be my Christmas present to you. Franco: Babe you are awesome. Do you know how much tickets cost by any chance? Wife: ………… Well, how bout you just take $250 and see what happens. Maybe you can find a desperate scalper. Franco: Dude, I’m in. Let’s go to St. Louis. I have a $250 budget, but let’s just go make something happen. B Witt: Awesome. Let me go tell my boss. I’ll come pick you up at 12:30. Your boss is cool with it? Franco: Crap. I was so excited, I forgot to ask. I’ll ask now. See you at 12:30. Both our boss’s are cool with us going… We might have claimed to actually have tickets to the game, but in our minds, it was only a matter of time. Franco: Dude, I know you’re working a half day today. Wanna go to St. Louis with B Witt and I for game 7? We’re leaving in 30 minutes. TStrick: Can you wait til 1:30? I just got to this luncheon. My boss put it on to recognize my performance on our last project, so I kinda have to stay for it. Franco: We will wait til 1. Get out of there asap!! TStrick: I’ll keep you posted. 1:30 pm- Leaving Nashville, riding shotgun to St. Louis with B Witt (Driving) and TStrick (Back Seat) to see where the night takes us! Game 7 here we come. GPS estimated arrival time 6:05pm. Game time 7:05pm. Franco: T, How did you get out of your own luncheon early? TStrick: I ate as fast as humanly possible and excused myself while people were still halfway through their meals. I told my boss that I just got offered a ticket to game 7 of the World Series and she stood up and announced it to the whole room. People seemed excited for me. Then I took off… Do we have tickets by the way? I’m assuming not. And where are we staying tonight? B Witt: No tickets. No idea where we’re staying. Still the cheapest we can find is $450. We all decide that our individual ticket budgets are $250. We also decide that when we get to the stadium, it’s every man for himself when it comes to buying a ticket/getting in the stadium. 2:00 pm- B Witt and Franco from the front seats: OOOOOOOOOOOHHHHHH COME ON!!!! YOU HAVE GOT TO BE KIDDING ME!!! Traffic jam. Middle of nowhere Tennessee. We aren’t moving. Quick debate about turning around. Traffic starts moving. We decide to press on. 2:30 pm- We are completely past all the traffic. Estimated St Louis arrival time 6:15. Conversation turns to how we can get into the stadium. Notice I said “get in the stadium”, not limiting it to just buying a ticket. Franco: Ok guys. We need to rake our brains for a few minutes and come up with a way to get into the stadium. I’ve bought reasonably priced tickets from scalpers to multiple playoff games and a Yankee/Red Sox game, but I can’t imagine there’s a discounted ticket to be found for game 7 of the World Series. Let’s get creative. -Finding a picture of an e ticket to game 7 of the World Series, swing by a Kinkos and print off three of them. Then the three of us would go to three different gates and try to talk the ticket scanning people into letting us in after the “ding” didn’t go off and they say our ticket isn’t valid… TStrick can’t find any e ticket pictures on his iPhone. TStrick: Climb the fence? Do you think we’re going to the local high school baseball field? Franco: Dude, that’s the dumbest idea I’ve ever heard. Even spider man would have a hard time executing that plan at Busch Stadium. B Witt: Ok, fine. You guys are probably right. I’m back to my riot idea. I think that could work. Franco to B Witt: Let’s get this out right now. Are you willing to go to jail tonight? B Witt: I don’t WANT to go to jail, but I’m not ruling it out. I’m going to do everything humanly possible to get into that stadium tonight. 2:55 pm- The light bulb in my head goes off. Franco: Guys, I got it! I have a legit idea with no chance of going to jail. So we’ve been seeing these signs for a casino coming up in about a half hour. What if we all put in $200, run into the casino, head right to the roulette table and put all $600 on red (for St. Louis). If it hits, we each have enough to buy a ticket. If not, we just take our $50 left over and have a good night watching the game at a bar outside the stadium. *Side Note: I’ve never played roulette in my life at this point. B Witt: That’s not a bad idea. TStrick jumps in from the back seat: Let’s keep thinking before we jump to any conclusions. I send out a quick email to a group of my closest friends outlining our situation, and asking for suggestions. Fool proof! The red bet gives you a 47.37% chance of getting in to the game. I can’t see anyway other than a fluke that you could find better odds than that. It’s confirmed on ESPN that regular seats are AVG of about $950+ and SRO is still $450+. I guess it’s possible you could ride it out til game time and see if you can find a desperate scalper that’ll go $250 but that’s highly unlikely. It’s unanimous, we’re doing it! 20 minutes till we get to the casino. 3:15 pm- Morale is high. We are convinced that we have a fool proof way to get into the game and we are pumped! 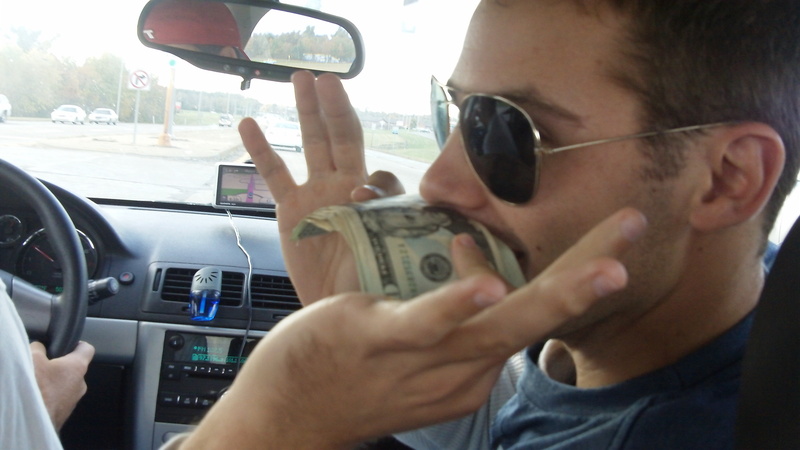 B Witt collects all of our money in the passenger seat and makes a “cash stache” (making a mustache out of the stack of 20’s) and starts making faces at all the cars we pass… We all agree that we are already at an 85 on the awesome scale. B Witt: Franco, give me your phone. I’m gonna take over your Next Level Ballplayer twitter account (@The_NLB). I’m going to tweet the crap out of tonight. Franco: Ok, but no cussing or inappropriate comments. 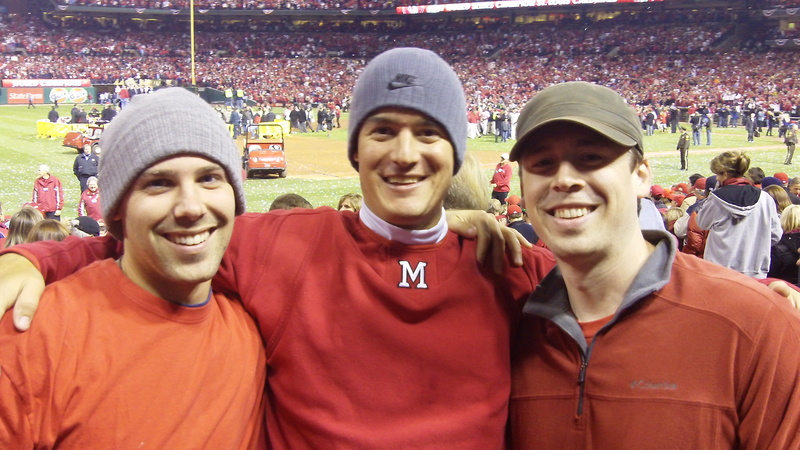 The_NLB: This is B witt commandeering nlb twitter as franco, t smooth and I head to game 7 in st. Louis. Stay posted. B Witt: Guys I’m freaking out up here. I just realized what we’re about to do! I don’t know if this is the best idea… AHHHHHHHHHHHHHHHHHHHH!!!! I keep seeing it land on black! It keeps landing on black!!!! We got to do it. Okay, Okay, we are doing it. We have to give this night a chance to be epic. -I will exchange the money and place our bet. Roulette lady: Are you sure you want it all on red? B Witt: LADY! Yes we’re sure!! We didn’t run all the way from the parking lot to hangout with you! We have to get to the World Series, let’s go! Tick, tick, tick, tick, tick… It seems like forever. We are ready to irrupt into joy until at the last split second when the ball bounces out of red 36 into black 11. B…L…A…C…K…11! $600 gone in less than 60 seconds. TStrick and I are silent in shock. B Witt loses it and starts causing a scene by yelling random curse words at the top of his lungs. Security starts walking towards us as we decide to start leaving. With a really confused look on her face, the lady that had checked our ID’s 90 seconds earlier: Are you guys leaving already? B Witt, still clearly in “causing a scene mode”: WE JUST LOST ALL OUR MONEY! $600 %$#*%&#@ DOLLARS!!! ID lady: Oh, I’m sorry. B Witt (as we are walking away): SO AM I! This was the worst idea ever! One more cussing tirade by B Witt ensues. The only thing TStrick and I can do at this point is laugh, which we are doing hysterically as we reach the parking lot. I decide B Witt isn’t fit to drive, so I hop in the driver’s seat. It’s now 3:41pm. Quick debate about turning around. Decide to keep going. Next stop, St. Louis. ETA 6:35 pm. 3:56 pm- We’ve been driving in silence for the past 15 minutes with B Witt occasionally letting us know that he feels like he has to throw up. B Witt: Franco, you’re awesome scale pep talk was a bunch of crap! You said, we’d be at a 60 if we lost our money. We are at a 10 right now! TStrick, why didn’t you talk us out of this?!?! Clearly Franco and I would make unreasonable decisions on our own, but you are supposed to be the voice of reason! This could not be worse. Before TStrick can answer, there is a cop behind us with his lights on. B Witt, flips out again, this time letting us know that his registration is expired. Cop: I got you guys going 89mph back there. Any reason you were going that fast? Franco: Actually officer we are heading to game 7 of the World Series. Cop (completely unimpressed): License and registration please. It hits me that we’re in Illinois and he’s probably a bitter Cubs fan. He takes forever and then comes back with a $140 ticket. No problem with the registration. It’s now 4:13 pm and the car awesome scale is at a 3 and that might be generous. Quick debate on whether to turn around. Decide to keep going. Next stop St. Louis… Please Lord, make our next stop St. Louis! We take the next 15 minutes to reflect on the fact that between roulette and speeding, we lost $740 in about 20 minutes. We all start feeling sick… At least we’re still under budget! 4:24 pm- We pass a sign that says something like, “$10,000 fine and 14 years in jail for hitting a construction worker.” We all agree that if that was ever going to happen to us, it would be tonight, in the next 10 minutes. We are really close to the trifecta of awfulness- Getting housed at the Roulette table, speeding ticket, and hitting a construction worker. B Witt also announces that he no longer will be tweeting for NLB and won’t be telling a soul about this trip. “Too embarrassing,” he says. 4:45 pm- B Witt claims that he’s not giving up and promises he will either get into the stadium or get arrested. 4:55 pm- Collectively we decide that roulette was the right thing to do. It was our best shot at getting in the game. We start feeling better. Awesome scale: 18. B Witt: Franco, I know there are a few casinos in St Louis. What if we all put in $50 bucks and you play poker with it, how sure are you that you’d win our money back. B Witt: That’s what I thought. Whenever we are done celebrating with the city of St. Louis, we’ll head to the casino and get our money back. 5:25 pm- We start talking about how awesome just being in St. Louis will be. B Witt turns the radio on to search for sports radio. Just like we were in a movie, the following line blasts out at us. “Hit me with your best shot! Come on and hit me with your best shot. Fire awaaaaay.” We all sing the rest of the song together and feel even better. Awesome scale: 62 and still trending upward. 6:50 pm- We see the St Louis arch. We’ve arrived! We park the car a mile away from the stadium at the Lumiere Place Casino and start running towards the stadium. We come up to the fountain park across from the capitol building and see thousands of fans watching the game on a huge projection screen. 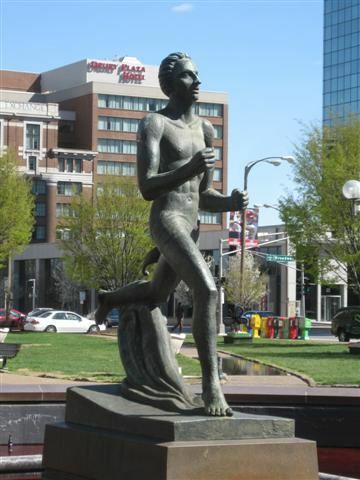 There is a statue of a large naked runner in the fountain. Despite the naked fountain runner guy, it seems like a great place to watch the game. Awesome scale is all the way back to an 80. We make our way to the front of the Busch Stadium. It is hopping. The energy is electric. As we get closer we see tons of people with their fingers in the air. Quickly, we realize that all these people are looking to buy tickets. The entire night would go by without ever seeing anyone selling tickets. Almost everyone is already in the stadium. On the other side of the turn styles, there are three rows of security officers standing around. All of our ideas are immediately deemed impossible. Even B Witt decides there is nothing he can do. He claims that next time he will dress up as a police officer and sneak in that way. We let him know that’s a horrible idea. David Freese hits a 2 run double. The stadium erupts! We long to be inside, but make our way to a close by sports bar. We get to a bar with people everywhere and within 5 minutes TStrick and I can’t find B Witt. Without becoming discouraged, we push our way to a below average view of a TV. B Witt hasn’t returned my texts. I suggest to TStrick that we go back to the fountain and watch on the huge projection screen. TStrick is mildly concerned that B Witt is MIA. I remind him that it’s every man for themselves and B Witt is probably doing just fine. (In the back of my head I’m trying to calculate the odds of him actually being inside the game or in jail.) We start walking towards the fountain as my phone dies. We stop to watch the bottom of the third in the doorway of a Busch Stadium office with a TV on. We strike up a convo with the 8 people huddled in the doorway and they give us incredible news. 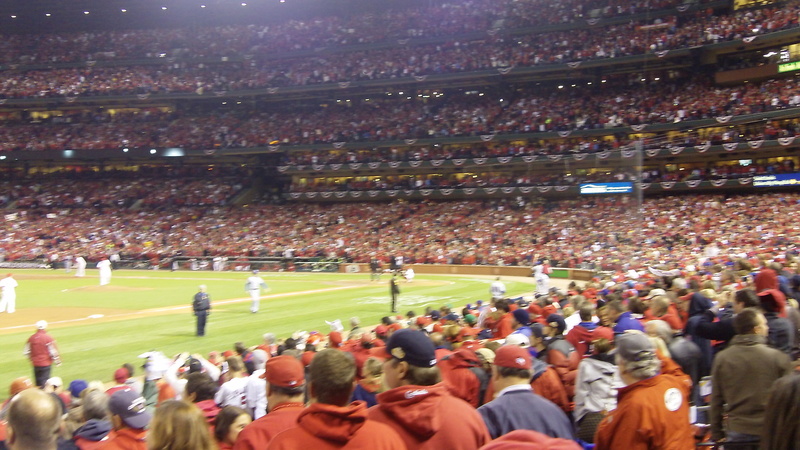 Apparently during the 2006 World Series in St Louis, they opened the gates for the 9th inning and let everyone in. This is awesome!! Hope abounds! With an extra bounce in our step, we continue on to the fountain with the naked runner. TStrick to B Witt: We’re at the fountain park. Just follow the naked runner’s junk. Cards score twice in the bottom half and lead 5-2. Fountain crowd going crazy. This is way better than the bar. B Witt: So I saw the text and started walking to meet you guys. When I got in front of the stadium, I noticed that they were letting people out for smoke brakes. Right then I accidently ran into a guy and he almost dropped his ticket. That gave me a great idea. Long story short, I just spent the last 30 minutes running into people that were smoking and trying to get them to drop their tickets. No luck. TStrick and I aren’t quite sure what to say. We tell him that it was a great idea and we can’t believe it then turn our attention back to the game… Still 5-2 Cards. B Witt (annoyed that I’m questioning him): Dude, 100%. If we don’t get in the stadium for the 9th inning, I am jumping in the fountain. I’ve seen that look on his face before. He’s telling the truth. The girls say they will wait for us to come back in case we can’t get in the stadium. We make our way back to the stadium gates. A huge crowd has gathered outside the gates. Clearly we aren’t the only ones with inside info. We worm our way towards the front until we are about 3 people back from one of the gates. B Witt starts the “Let us in” chant. 20 seconds later all 300+ people are yelling it at that top of their lungs… A small army of security guards just stare at us from the other side of the fence. They don’t look like they’re planning on letting anyone in. The chants and collective yelling, doesn’t seem like it’s working. One fan in front of us decides to takes matters into his own hands. This is our huge break! He reaches through the fence, undoes the dead bolt, and next thing you the gate right in front of us swings open. It was as if the Red Sea had just been parted, chaos ensues. I get in right away. The security army runs to close the rogue gate. TStrick and B Witt slip in while the gate is 3/4s of the way closed and then sprint to catch up with me. Adrenaline is off the charts as we rush down the stairs and behold the Mecca of the 2011 Major League Baseball season. We continue down the aisle until we are 10 rows up from 3rd base. Words can’t describe the atmosphere while Motte is taking his warm up pitches before starting the 9th. Everyone standing. Everyone cheering. Electric. None of us have words to say. Finally B Witt looks to TStrick and I: We made it! Awesome Scale: 100!! Busch grows louder with each out before Motte gets Murphy to fly out to left. Confetti drops. Pandemonium ensues. 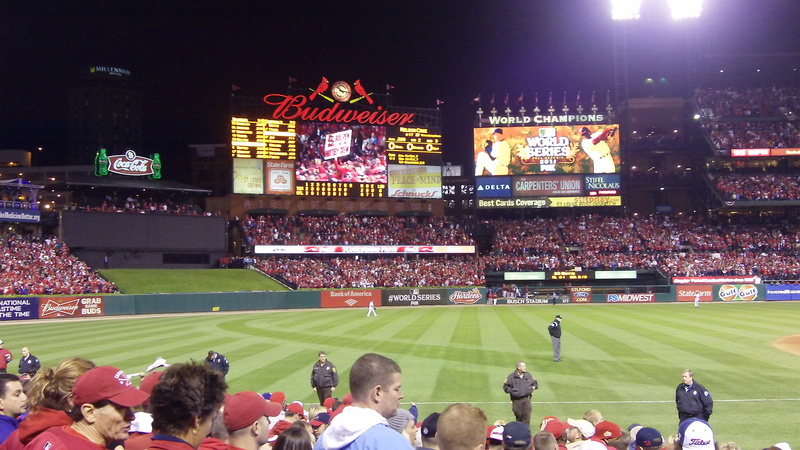 We are there to witness the final out of the 2011 World Series. We hang in the stadium for a while, living it up with the Cards fans during the trophy presentation. When we finally leave the stadium, we spend the next few hours hanging with thousands of Cards fans in the streets. Everyone was high fiving everyone. Cars were honking. Everywhere you looked was a sea of red with huge smiles pasted on every face. We are still high from our good fortunes of getting in the game and decide all we have left to do is win our money back at the casino. The plan: Franco plays poker while TStrick and B Witt go play table games with $40. I sit down at the poker table. TStrick and B Witt ask me what color to put their roulette bet on. I say Red, they take off. I’m up around $100 and there’s no sign of the guys. I assume that my great advice of putting their money on red worked. I feel good. I am up over $250 and thinking that it’s a good sign that TStrick and B Witt still haven’t returned. They finally return and announce to me that they are up over $200 after a combo of roulette and craps. Franco: I told you red would hit! B Witt: Dude we put our money on black. Franco: But I said red. TStrick: Yeah, we decided to go with the opposite of whatever you said. Black hit. Then we let it ride and it hit again. Then we had $160 and headed to the craps table. Franco: Oh… Well, good job. Let’s take our money and run. We’ve accomplished more than we thought possible and decide it’s time to head back to Nashville. While we are at a stoplight in downtown St. Louis, this clean cut guy in a red suit comes up to our window with a beer in hand. Red Suit guy: Where are you guys headed? Red Suit guy: Perfect, that’s right on the way to the bar we’re heading to. I’ll give you 20 bucks to drop us off. B Witt: Cool, hop in. Red Suit, his buddy and his girlfriend now start trying to squeeze in the back seat with TStrick… who had no say in this. Girl gets in first, then Red Suit, and now the buddy can’t fit. Before TStrick can say anything, this random girl is sitting on his lap, the other two guys pile in the car, and we are off. She doesn’t bother switching laps once everyone is in. TStrick has a new friend. We find out some very interesting things as we’re driving towards the “bar”. -The girl is completely comfortable with sitting on TStrick’s lap. He is not. 3:30 am- Our passengers find out B Witt and I played college baseball and that we know some of the same people. We have a great baseball discussion while TStrick engages in awkward small talk in the back corner of the car. Time to go home. What a perfect ending to an unreal night in St Louis! The only word that does it justice- EPIC! After a taco bell run, a few hours of napping at a rest stop, and a lot of lively reflection on the twists and turns of the night- We arrived home to Nashville. Average out of pocket spending when all was said and done (food & gas included): $72. Total trip time: about 20 hours. 20 epic hours that none of us will ever forget. If you are interested in the business field, check out degree programs at Online-MBA.com.